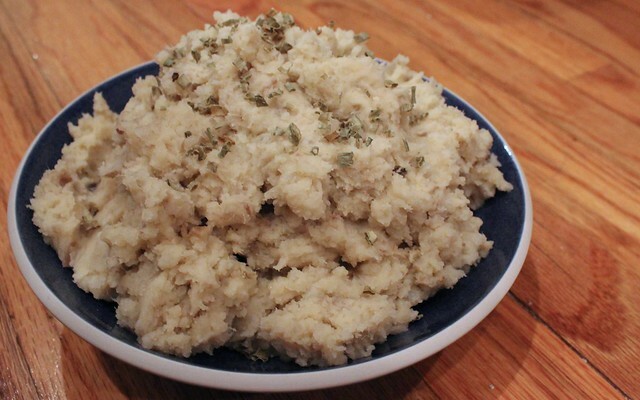 As my brother and I prepared the Christmas menu (our second year doing it), my mother brought some boniatos from the market and I instantly had the idea–let’s make mashed boniato with them! I was met with some very skeptical faces. My mami had never heard of such a thing and my brother just wasn’t sure that it would work with the boniato’s dry, flaky interior. But I insisted–and what we ended up with surprised everyone. The other day I walked into my local NYC grocery store and was, I admit, shocked to find my favorite type of sweet potato here in the big city. Remembering the sweet comforts of home, and the delicious meal we had a few months ago, I immediately bought some–ready to cook them up all over again. And man, did it turn out just as delicious as before! Boniatos, the Cuban white sweet potatoes, make for a delicious side dish when you mash them. Meanwhile, the egg helps to add a bit of creaminess (and protein!) without the fat of cream. After you have boiled the boniatos until they are done (you should be able to easily stick a fork in), let cool for about 5 minutes. In a large bowl, combine the ingredients and mash together until all sweet potatoes have been broken down to your desire level of chunkiness. You can also use a mixer to whip the potatoes. Garnish with fresh or dried chives. Have you ever made a side dish with Cuban white sweet potatoes (boniato)? This entry was posted in Cuban, Gluten-Free, Sides, Vegetables and tagged boniato, cuban, gluten-free, sides, vegetables, vegetarian by Irina Gonzalez. Bookmark the permalink. This is life! I grew up eating it… y pure de malanga. The best! 🙂 I need to blog about the latter since it’s something so key in my diet. Yes, you totally should! I looooved making this for Christmas this past year, and I hope to keep doing it! It’s a more fun take than mashed potatoes. thanks Irina for the recipe. I am fan of boniato. I always enjoy it. I use to make a dressing with olive oil, garlic , Romero and some times basil. Thanks.. I cook my whole boniato in the microwave in a covered baking dish with no water. The skin comes right off afterwards and it’s ready to go! I like to use butter and sometimes add crema. Definitely a tasty carbohydrate and goes great with roasted chicken or pork! Yum!! I tried mashed boniato yesterday, with cream added. It turned out very heavy, compared to mashed white potato. Any thoughts about how to lighten it up?